You're all alone at this night job you just got, working security at a children's pizza parlor. What could go wrong... right? At least the there's a soft glowing light to keep away the terrors! Collect your favorite characters from the hit survival-horror game, Five Nights at Freddy's. They even glow-in-the-dark! Each stylized vinyl figure measures 2 1/2-inches tall and comes packaged in blind boxes. Collect them all! Ages 8 and up. 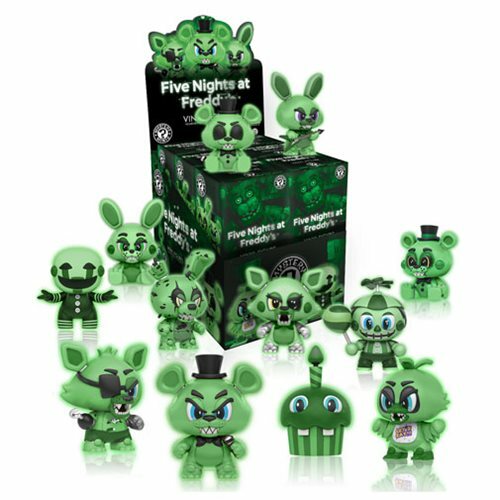 The Five Nights at Freddy's Glow-in-the-Dark Mystery Minis Series 1 Random 4-Pack includes 4 individually packaged, blind box mini-figures.